Celebrity fragrances are becoming more and more common these days from the A list right down to the Z list. Now and again one fragrance comes out which personally could easily pass for a perfume from one of the top fragrance houses. 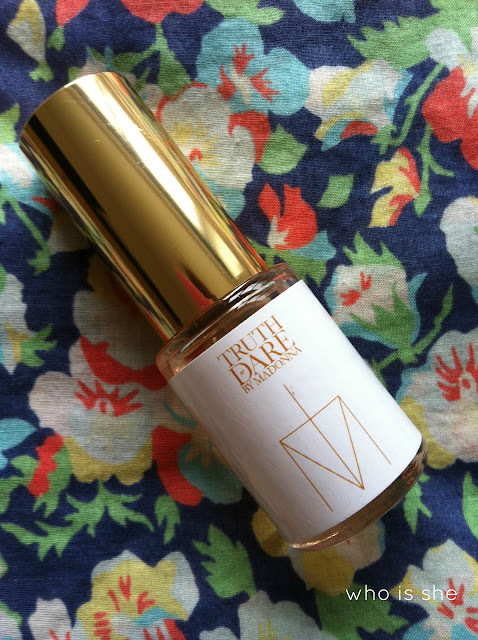 This perfume is Truth or Dare* by none other than the Queen of Pop- Madonna. Over the last few weeks I’ve been testing this perfume and even though I have made my mind up about this perfume I had to wait until after wearing it for a night out until writing this review. “Combining a unique blend of narcotic floral balances with addictive woods and vanilla, Truth or Dare challenges customers to get in touch with the dual forces that coexist in everyone. Darkness vs light, innocence vs deceit- the fragrance dares to expose what lies beneath”. In all honesty I don’t really know what I was expecting the fragrance to be like, however I am obsessed with it. Its one of those “strong” scents, which to me I would prefer to wear during the day, rather than on a night (if that makes sense). The floral undertones is very prominent, however personally this is what appeals to me when it comes to picking out perfumes. Normally for work I apply perfume around 7am and then I normally only reapply if I am going to a meeting or going out for lunch/after work, so usually any scent is long gone by lunch. When testing this I have deliberately only applied this once in the morning- one squirt on my wrists and one on my neck. Truth or Dare has serious staying power- this lasted until I got to the gym (4.30pm) and I could still smell this post workout. Come to nights out- this yet again passed the test- normally I top up my perfume throughout the night, however on Sunday I made Steph keep hold of this bottle to prevent me from reapplying. By the end of the night the scent was still present, however it wasn’t as strong as it was when I wear it during the day. Since wearing this I’ve received so many compliments from my work colleagues/friends as to what I’ve been wearing, so once my sample is used up I’m definitely going to purchase the 30ml bottle. The Eau de parfum retails for the following amounts 75ml- £42, 50ml- £32, 30ml- £25. Currently Truth or Dare is being sold exclusively in Selfridges (both in store and online), however this will shortly be getting rolled out to the usual perfume retailers. When seeing the advert for Madonna's fragrance on TV i was decidedly skeptical, but thanks to your review I think once my current fragrance runs out I think I might go for the 30ml bottle as it is so reasonably priced...Thanks Ray!